Brooklyn will soon be joining many major cities around the world that have an innovative and clever alternative means of transportation at their disposal; and that is a European style bike sharing program. The Department of Transportation of New York City announced yesterday that Alta Bicycle Share won the contract to operate the bike system, after an evaluation of several proposals by a number of different companies specializing in creating and running such systems. Alta Bike Share will not need any taxpayer money to run the program, and any profit they have will be shared with the city as a result of a revenue sharing agreement which is part of the deal. Brooklynites will be able to use Alta bike share bicycles for a yearly or monthly fee, which will be made available to them at bike stations located at a large number of crucial spots around town. 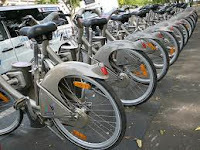 The idea is that riders take a bike from one station, for instance near their homes, and leave the bike at another station, perhaps near a subway stop. Alta Bike Share published their preliminary plans for station locations. They are planning on building stations in Brooklyn stretching from Greenpoint, Kensington and Brooklyn Heights to parts of Bedford-Stuyvesant and south to Park Slope.